Not many cars have had as hard a road to traverse getting into the marketplace as Tesla’s Model 3. Developed as a mass-market alternative to the bigger, costly Model S electric sedan, the battery-powered Model 3 has undergone a series of production obstacles. Production began during 2017. Several hundred thousand prospective buyers plunked down a $1,000 deposit. As of June 2018, though, fewer than 31,000 have been manufactured, according to Bloomberg. Though production has been growing, that’s still far short of Tesla’s goal: producing 5,000 cars per week. Four versions have been announced. The Long Range model promises an EPA-estimated range of 310 miles, while the base version is rated at 220 miles. Coming later is an all-wheel-drive version. A performance variant also will include all-wheel drive. A 192-kilowatt (258-horsepower) electric motor drives the rear wheels. The two versions use battery packs of different capacities. Tesla has declined to provide battery capacity figures, but they’ve been estimated at 50 kilowatt-hours for the base model and 75 kWh for the Long Range version. Build quality of early examples has been variable. Many owners report no discernible problems, but others have been plagued by issues. Our own test Model 3 handily qualified as dreadful. Tesla’s Model S and Model X have earned good crash-test ratings, but the Model 3 has not yet been tested. Automatic emergency braking is standard. Adaptive cruise control is available only with the $5,000 Autopilot package, which also includes blind-spot monitoring, forward-collision warning, active lane control, and automatic headlights. Despite the glaring quality concerns, Tesla is gradually delivering on its promise of a moderately-priced model. As of mid-2018, only the higher-cost Long Range model was available. Tesla advises that anyone seeking the $35,000 base model should expect to wait 6 to 12 months. For all-wheel drive and Performance models, the wait is 6 to 9 months. Even for the rear-drive Long Range model, buyers can expect a 4-6 month delay for delivery. Production has not yet reached, or even approached, Tesla’s lofty goal. Still, in the first five months of 2018, an estimated 19,000 have been delivered to customers. During that same period, Bloomberg estimates that more than 30,000 were built. 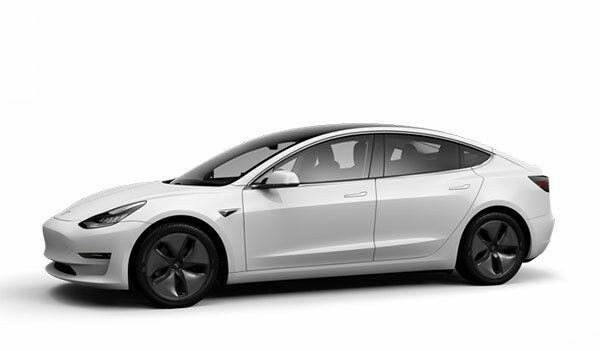 Long Range Model 3 ($44,000) contains a larger battery pack, boosting range from 220 to 310 miles. Options include heated seats with premium trim and upholstery, 12-way power front seats with memory, premium audio, tinted glass roof, heated foldable side mirrors, and LED foglamps. A $5,000 Premium Interior package is available. The $3,000 Autopilot package bundles several active-safety features and, anticipating the future, Full Self-Driving Capability. All-wheel-drive and performance models (not yet priced) are expected to debut late in 2018. Like the company’s larger models, the Model 3 is readily recognizable as a Tesla. Similar in size to BMW’s 3-Series, the four-door sedan has a small trunk opening. In addition to larger dimensions, the original, more elegant Model S is a hatchback. Both cars share a fastback profile, promising minimal wind resistance and, therefore, greater energy efficiency. Each Tesla’s rounded snub nose contains a V-shaped emblem, lacking any hint of a grille. Minimal energy use at road speed indicates that Tesla has succeeded admirably in the technological sense. A touch of that efficiency is attributed to the Aero wheel covers, yielding an extra 5 to 15 miles of driving per charge. Simple and uncluttered, but attractive, the cabin blends a futuristic aura with luxurious accents. Occupants might easily imagine they’re ensconced in a designer-created living room. Nearly all control functions are handled via a 15-inch centrally mounted touchscreen, or via vocal commands. Below that striking display, the dashboard is devoid of buttons, switches, or knobs. Exceptions include stalks for lights and wipers. Front seats are supportive and amply-bolstered. Drivers can expect a somewhat legs-out position, but plenty of head clearance. Rear seating is reasonably comfortable, though lack of footwells may force riders into a knees-up position. Flat seat cushions could use additional bolstering. Backrests recline more sharply than in many cars, providing head clearance for all but the tallest adults. Cargo volume measures 15 cubic feet, including a small auxiliary trunk up front. Comfortable and quiet, as expected, the Model 3 also provides good driving dynamics. While not particularly sporty, the midsize sedan is smooth and quick, accelerating briskly, while clinging tenaciously to the pavement. Acceleration to 60 mph is estimated at 5.1 seconds for the Long Range version and 5.6 seconds for the base model. Comfort, Normal, and Sport settings vary steering effort. Slightly heavy steering makes the Model 3 feel like a bigger car. Through twisting roads, the Model 3 clings to the road and corners predictably. When rolling straight ahead, however, it tends to wander mildly. This might be caused by lack of toe-in within the steering system, keeping the front wheels dead straight rather than slightly angled, as on most cars. Tesla’s setup aims for greatest energy efficiency. High tire pressures also boost efficiency. Regenerative braking is fairly strong. Unlike some competitors, letting up on the gas pedal can result in a brief pause before regeneration kicks in. First-time Tesla drivers need some start-up instruction. To unlock the car, and then fire up the system, the driver must tap a card against specified locations. After the touchscreen is set up, driving begins to feel natural. Ever since 2012, Tesla has dominated the range ratings for mass-produced electric cars. In addition to a 310-mile range estimate, the Long Range model is EPA-rated for energy efficiency at 130 MPGe (equivalent miles per gallon). That’s an impressive figure, compared to ratings for smaller, slower electric automobiles. Model 3 owners get access to the Supercharger network, though use of that quick-charging service is no longer free. An adapter cable permits use of public charging stations. In addition to range estimates that make moderate-length trips possible, the Model 3 scores admirably for performance and design, as well as ample standard equipment. Based upon experiences with early examples, build quality is the main concern. Recently-built models might be substantially improved, but prudence dictates seeking the latest reports on product quality.